This weekend I was excited to finally see the much awaited Straight Outta Compton, which is a biopic following the members of N.W.A. In the last few decades, Hollywood has churned out dozens of biopics profiling individuals in Music; however, this would be the first that would follow individuals whose music influenced a lot of the music that I listen to today. The only fears I had going into the film was whether or not the story would be accurate, and if it would include the negative things our protagonists did or if it would be a glorified retelling, making the protagonists infallible heroes. 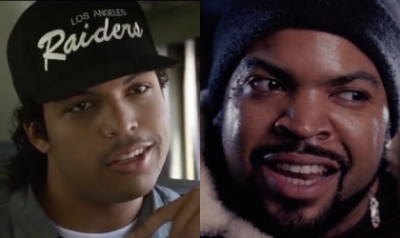 This was a bigger concern than normal, considering two N.W.A. members, Ice Cube and Dr. Dre, produced the film. It is very hard to make a biopic that is successful, due to several difficulties in adapting real life events of famous figures into a film. 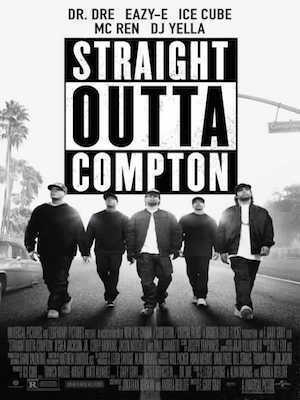 As you read this review, it is apparent that Straight Outta Compton is the new bar filmmakers should set for music biopics. Biopics normally suffer from one of two things in terms of acting. You either get a really rich performance from someone that vaguely resembles the historical figure, or you get a great impersonator who just got his first job in front of the camera. While one is obviously more preferable than the other, viewers still yearn for a winning combination of both. Quite frankly, Straight Out of Compton not only does a good job of this but also perfectly executes it. From the members of N.W.A. all the way to a brief Tupac cameo, those who are fans of the 90’s hip hop scene can easily identify who is on the screen before they are introduced. This allows the audience to feel as if they are actually watching the real events of the musicians that the film chronicles, rather than a reenactment. The best part about the casting choices of the film was that these look-a-likes were actually very good actors; there wasn’t a time during the film that the dialogue fell flat or any instance in particular that brought me out of a scene. This is something that many would think about in hindsight after viewing the film, but what I took away from it was that by the exposition, I could tell that the filmmakers were there to make not only a quality film, but one that truly expressed the story they were here to present. The film also handles its story in a way that allows for multiple story arcs to be present throughout. Instead of focusing on the accomplishments of the group as a whole or just profiling one individual, the film gives each member equal screen time, and shows their lives outside of the group. This not only allows the audience to lean more about the lives of the characters, which is the ultimate purpose of the film, but it also allows for our characters to be more than just musicians, and become symbols for larger social issues, which is where the film really begins to elevate itself from its traditional biopic genre in a somewhat ironic way. One of the reasons that N.W.A. became so popular was because of the anti-police brutality statements that they popularized during a period where the issue was very relevant. Low and behold, nearly 25 years later, the film is able to bring the issue back to the lime light during another peak of violence. Finally, one of the biggest reasons that I think the film is exceptional is the fan service that it provides for fans of hip hop, which, realistically, is going to be the intended audience for the film. Not only does the film sprinkle an appropriate amount of music relevant to the group throughout the film, but it does it in a way that connects with the story, so that it feels organic, instead of haphazard montages with popular musical tracks in the background. In addition, the film includes several brief cameos of figures that are important to hip-hop, creating a “Marvel Cinematic Universe” type fill to the film. It would actually be very interesting to see if the studio plays off of this idea by having a shared universe, filled with films that focus on particular musicians that were more or less background attractions this time around. In conclusion, I think that the film serves as a great example of what every biopic should aim to be. It accurately tells the story without sugar coating negative things. It has a great cast of characters that not only allows for believable characters, but also allows for the transmission of larger social themes. The only issue that I think takes away from the film is the pacing. During the film, I thought it was easily over three hours, when it was just a bit over two. This is not necessarily a bad thing if you are interested in the subject matter, which can vary depending on your fondness of hip-hop. If you have not seen the film already, I highly recommend going out and doing so, because it is definitely one that benefits from a theater showing. In my opinion, the film deserves a solid 4 out of 5 reels, give or take a reel depending on your fondness of the hip-hop genre, because that is really what the pacing of the film relies on. How many Reels do you give Straight Outta Compton?